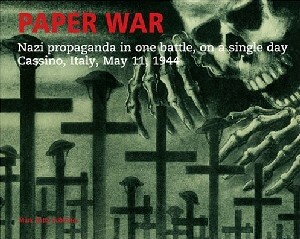 Propaganda is as much a weapon as guns and tanks, and it was deployed by German forces at the ferocious Battle of Cassino in May 1944 in hopes of impelling members of the multinational Allied forces to desert their comrades. This book is a catalog of propaganda leaflets collected during the battle by a British liaison officer in the Indian army, documenting the Nazi's skillful but ultimately unsuccessful campaign to win the battle by literally barraging the enemy with widely varying messages in English, Polish, Urdu, and Hindi. The leaflets are reproduced in color in their original size, along with field sketches of a rocket launcher used to scatter them over Allied troops.